Text boxes are helpful little document elements that can be beneficial when you need to add something to your document that isn’t working properly within the confines of the standard document layout. You can customize the text box without modifying the rest of your document, which offers some great options in terms of design. However, you might have a text box that contains a fill color which is being problematic. Fortunately the text box fill color is something that you can change, or even choose to remove completely. 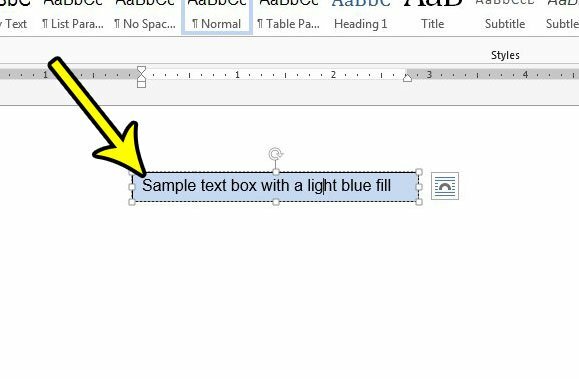 Our guide below will show you where to find the text box fill color setting and remove the fill color from your selected text box entirely. The steps in this article assume that you have a text box in your Word document, and that the text box has a fill color that you don’t want. 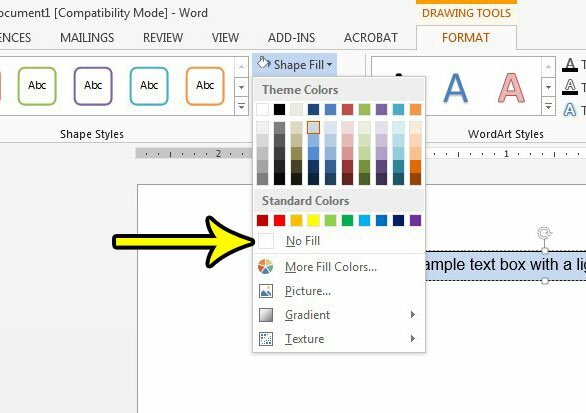 We will be focusing specifically on removing a fill color in Word 2013, but you will have the option of changing to a different fill color if you prefer. Additionally, note that there is a difference between “No Fill” and a white fill. Step 2: Click inside the text box containing the fill color that you want to remove. Step 3: Click the Format tab at the top of the window, under Drawing Tools. Step 4: Click the Shape Fill button in the Shape Styles section of the ribbon, then select the No Fill option. Note that selecting the No Fill option gives you a text box with a transparent background. If you don’t want your background to be transparent, then select the white color on the menu in step 4 rather than selecting the No Fill option. 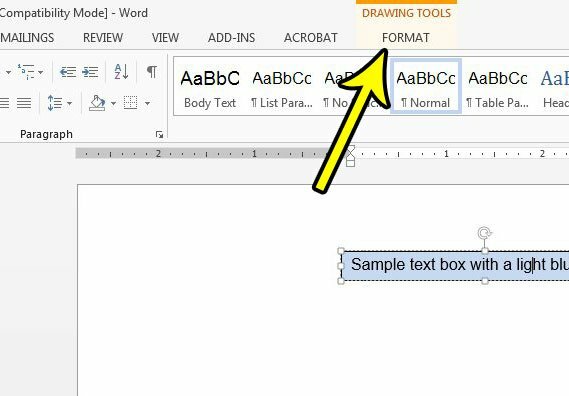 Do you need to add a background image or a watermark to your Word document and can’t figure out how? Learn how to use a background picture in Word 2013 if your current document needs call for one.